Just a month old and named after Steinbeck’s famous book about the Salinas Valley, Yeast of Eden, open for business in the Carmel Plaza, is a sister restaurant of the Alvarado Street Brewery and Grill, but has a whole different aesthetic, sporting gastropub cuisine with exotic dishes from South America to Southeast Asia and plenty of spices from all over the world. 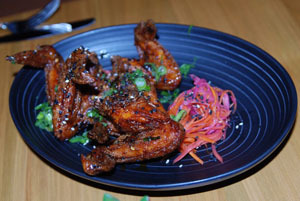 For an appetizer, the Saigon wings ($13), which come with five pieces, are truly mouthwatering. The spicy fish sauce caramel is the most tantalizing ingredient, making the chicken wings both sweet and spicy. They have green onion sprinkled on top and come with a side of radish and pickled papaya. Mmhm! The menu has several options for street tacos, all of which come in pairs. The carnitas street tacos ($10) are juicy, spilling all over the plate, but they’re well worth it because the taste is phenomenal and unmistakably authentic. The cheese is appropriately strong, but not overwhelming, and the tortilla is warm and tender. Much of the same descriptions roll over into the Korean steak street tacos ($11) as well. These have a serious, robust taste, packing some colorful eastern vegetables and a side of kimchi. As you can imagine, so far, this meal does not disappoint. If you aren’t full yet, let me walk you through some of their dessert options. The churros ($8) have an authentic taste. They aren’t as sweet as most churros you’ll find are, but they do bring out the warm, cinnamon taste that’s so often drowned in sugar. The most popular of the desserts, however, is certainly the chocolate stout cake ($8), punctuated with a dollop of salted caramel ice cream on top. I think this last dessert speaks for itself. In the end, I was quite content with the service I received and the experience I had. This pronounced restaurant-bar shouldn’t go under your radar. Yeast of Eden is open from 11:30 a.m. to 11 p.m. on Sunday through Thursday, and from 11:30 a.m. to midnight on Fridays and Saturdays. They serve from their happy hour menu on Monday through Friday from 3 p.m. to 5 p.m.